Even for the most narrow focus and tunnel-vision of economists, it would of course be ludicrous to claim that economic issues are foremost among the disputations surrounding the Palestinian territories of the West Bank and the Gaza Strip. But the economic issues are far from nugatory, either. When you have a population with a per capita GDP below $2,000, when unemployment among young men aged 15-24 is often near 40%, when wages have been falling for a decade, and when foreign aid has recently fallen from one-third of GDP to 6% of GDP, then the economic situation is going to be part of what is generating turmoil and discontent. 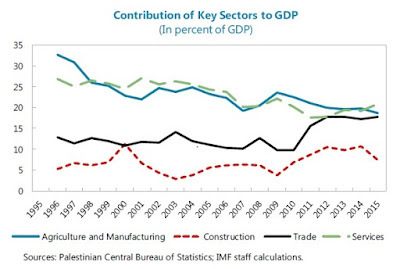 Jacob Udell and Glenn Yago provide a readable overview of the topic in "Still Digging Out: The Economics of a Palestinian Future," which appears in the most recent issue of the Milken Institute Review (Second Quarter 2017, 19:2, pp. 78-85). For additional background, the World Bank has published the "Economic Monitoring Report to the Ad Hoc Liaison Committee" (May 4, 2017), and the IMF gas has published "West Bank and Gaza: Report to the Ad Hoc Liason Committee" (April 10, 2017). Here, I'll draw on all three report. 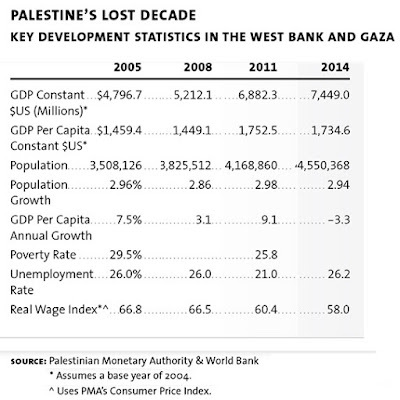 Udell and Yago describe the problems of the economy of the West Bank and Gaza in some detail. Here's a trimmed-down version of a table from their article (I'm showing three-year intervals, rather than every year). "Though the labor force participation rate is currently at its highest since 2000 (at an unimpressive 46 percent), it has been accompanied by an overall spike in unemployment — implying that the net entry of job seekers into the market exceeds the ability of the economy to create employment. Meanwhile, the Palestinian Authority has also become the employer of last resort, with 23 percent of the workforce on its rolls. The wave of youth entering the labor market in the past decade, coupled with the frictional and structural unemployment of the adult population and almost nonexistent job growth, has left youth unemployment at alarming levels. Since 2001, for instance, unemployment among males aged 15–24, which seems to function as a leading indicator of civil unrest, has averaged 35 to 40 percent and reached 43 percent in 2014." "Since 2005, real average wages have decreased by some 10 percent, while unemployment remains at around one-quarter of the labor force, and average GDP growth lags behind population growth by 2.6 percent per year." "And while considerable sums flow into the territories from overseas Palestinians, there are no “diaspora bonds” or other vehicles to facilitate investment by Palestinian ex-pats (whose wealth estimates by the World Bank have varied from $40 billion to $80 billion). One mark of a lack of confidence in the economy: Palestinian investment abroad in 2015 was $5.9 billion — $1.3 billion more than foreign investment in Palestine." "Currently, only 40 percent of those aged between 15 and 29 are active in the labor market, reflecting high pessimism regarding employment prospects. Despite a low participation rate, unemployment amongst this category reached 27 percent in 2016 in the West Bank and a staggering 56 percent in Gaza. ... In the medium term, real GDP growth is projected to hover around 3.3 percent. This growth level implies a stagnation in real per capita income and an increase in unemployment. Moreover, downside risks remain significant. As mentioned earlier, the [government budget] financing gap for 2017 is unprecedented in terms of its size, and risks significant economic and social consequences if it is not closed through additional finance or policy measures." "For such a small economy, achieving a sustainable growth path depends to a large extent on its capacity to compete in regional and global markets and increase its exports of goods and services. The Palestinian economy, however, has been losing this capacity as a result of a poor business climate mainly driven by externally-imposed restrictions on trade and access to resources in addition to the lack of political stability. In fact, the structure of the economy has substantially deteriorated since the 1990’s. For instance, the manufacturing sector, which is usually one of the key drivers of export-led growth, has largely stagnated and its share in GDP has dropped from 19 percent in 1994 to 11 percent in 2015. The share of the agriculture sector has also declined from 12 to 4 percent over the same period. In relative terms, most growth occurred in public sector services over the past two decades. Private investment levels, averaging about 15 percent of GDP in recent years, have been low and concentrated in low productivity activities less affected by political risk. Palestinian exports are focused largely on low value added products and services and their share in the economy has been low and stagnant at 17-18 percent. 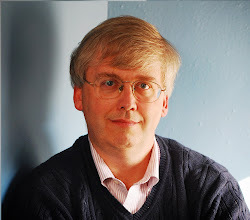 The substantial amounts of financial assistance from the international community received over the last two decades have so far helped mitigate the impact of the restrictions on growth, but aid has significantly declined in recent years (from 32 percent of GDP in 2008 to about 6 percent of GDP in 2016) and cannot continue to substitute for a poor business environment." "For example, agriculture and manufacturing together accounted for almost 33 percent of GDP in 1995, but their share had almost halved to 17 percent in 2015. At the same time, other sectors that might compensate as an economy develops (e.g., services) did not gain ground. While trade is one exception, the large structural trade deficit weighs negatively on the capacity of industry to create jobs." "The Palestinian territories rank as the second largest source of international migrants in relation to its population in the world, after Syria. The magnitude and importance of remittance inflows to Palestine are undeniable. According to World Bank estimates, remittance inflows to the Palestinian territories were USD2.2 billion in 2015. This estimate does not include compensation of Palestinian employees working in Israel, which, according to the PMA [Palestine Monetary Authority], are an additional the USD1.2 billion. Remittance inflows are also significant when considered relative to the size of the economy and other important financial flows. Inward remittances are about 17 percent of GDP, making the Palestinian territories one of the top 20 most remittance-dependent countries in the world. If compensation of Palestinian workers in Israel is included, the inward remittance flows rise to 26 percent of GDP. Further, inward remittances are twice as large as exports and comparable to aid including transfers to non-governmental organizations. Remittances exceed Foreign Direct Investment by a factor of 10 to 15." "The Palestinian territories’ trade deficit is also a product of dependence on Israel and a lack of diversification of its trade partners. Israel is the biggest market by far for Palestinian goods, accounting for some 85 percent of Palestinian exports, which highlights the lack of Palestinian business development in the markets of Europe and the rest of the Middle East. Israel is also the territories’ major supplier, accounting for 60 percent of total imports." 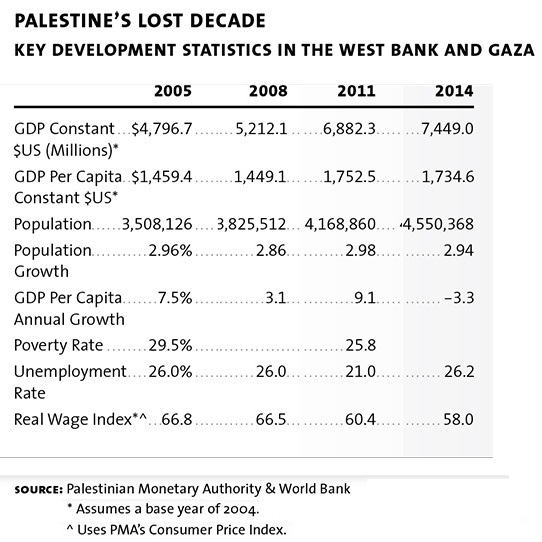 What are some potential areas on which economic growth in the West Bank and Gaza might build? One possibility is to seek to build ties of trade and migrant workers with Arab countries across the Middle East. Another is to emphasize better conditions for businesses to operate in the West Bank and Gaza. For example,the World Bank report notes at one point, "[I]t is vital for the PA to address institutional reform to ensure that energy suppliers are paid for their service – which is critical for both energy imports and investment in generation." That advice hits at a deeper problem for any business thinking about operating in the area. Like Israel, Palestine lacks natural resources. But it does have a wealthy diaspora, a cultural commitment to education, and strong entrepreneurial and trading traditions vital to a modern, skills-based economy. Palestine could also capitalize on the good will and proximity of the Arab world; if it built efficient capital markets in a politically stable setting, Palestine could become a financial and commercial-services hub for the Arab East. It could also take advantage of historically low interest rates and the ability to leverage bilateral and multilateral guarantees to develop infrastructure in water, alternative energy, environmental protection, tourism, transportation and communications. Water. A handful of specific river basin projects would have an immediate impact on living standards in Palestinian cities and villages, as well as provide water for higher productivity agriculture and industry. Energy. Natural gas production, electricity cogeneration and alternative fuels production (solar, biomass renewables) would reduce the need to spend scarce foreign exchange on imports and in some cases have the potential to be highly profitable. These projects would also generate stable, predictable revenues that could be used to leverage added private fund-raising. Trade, tourism and transportation. Here, we would include regional inter-urban rail, port and, eventually, air facilities, as well as destination tourism at religious, archeological and recreational sites. It could be time to revisit the RAND Corporation’s attempt in the Arc Project to plan infrastructure to support commercial and residential development in an increasingly urbanized country — and offer viable alternatives to continuing life in refugee camps. Housing construction and finance. The expansion of markets for mortgages would stimulate homeownership and urban revitalization, as well as invigorate focus on green buildings and sustainable housing in this fragile semi-arid environment. Frankly, some of this reads like pie-in-the-sky advice to me. I have a hard time envisioning that "Palestine could become a financial and commercial-services hub for the Arab East." But the hard reality is that economic future of the West Bank and Gaza can't be based on foreign aid checks and government jobs. On the World Bank "Doing Business" indicators, the West Bank and Gaza rank 140th, right between Lao PDR and Mali. Among its neighbors, the West Bank and Gaza ranks ahead of war-torn Syria, Libya, and Iraq, but behind Egypt, Iran, and Jordan. In the Middle Eastern region, Morocco ranks 68th and Tunisia 77th in the Doing Business" indicators.